It’s kind of remarkable what Gotham can do when it cans its case-of-the-week villains and doesn’t engage too heavily with the Batman canon. “Everyone Has A Cobblepot” still boasts many of the show’s worst qualities: an obtrusive score, a lack of logic, and misguided attempts at cartoonish comedy. 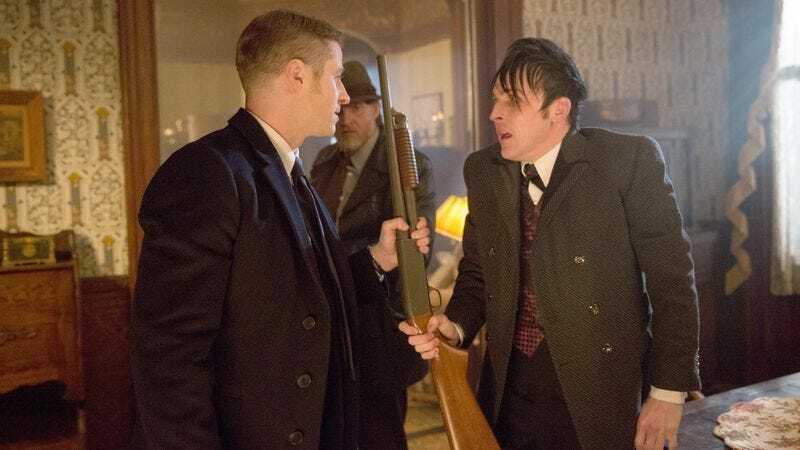 With that said, the episode is also the strongest of the season, and coupled with last week’s solid episode, shows that Gotham has at least a few compelling elements going as the show begins to wind down its first season. What largely makes the episode work is that it presents a complex, but not convoluted narrative, which deepens our understanding of a handful of central characters and the city of Gotham. The show has always been billed as one that’s not about Batman, but rather about the city that produced the caped crusader. Much of this season hasn’t told us anything meaningful about Gotham though, or given us an understanding of the details and personality of the city. By focusing on corruption within the GCPD, and how that corruption extends to the city and its criminal underground, “Everyone Has A Cobblepot” gives us an understanding of Gotham that’s been lacking all season. The catalyst for such insight is the release of Arnold Flass. His murder charges have been dropped, and it’s clear to Gordon that it’s because of someone within the GCPD. When Gordon finds out that it was Commissioner Loeb who influenced Flass’ trial, he sets about taking him down. He pays a visit to the Commissioner’s office and tells him that there’s no way any evidence or testimony in defense of Flass could possibly trump the fact that they had the murder weapon and Flass’ fingerprints. The Commissioner reveals that, in fact, there is one piece of testimony that would, and that’s a recorded confession from Bullock where he admits that he submitted false evidence to the case. There’s always been a certain tension between Bullock and Gordon, but this is the first time that tension hasn’t felt contrived. Both detectives have a valid perspective of what it means to be a cop in Gotham, and they’re equally stubborn about those perspectives. Gordon is the newbie who thinks he’s invincible and can change the system, while Bullock is the veteran who knows how to play the game and stay alive. When Gordon pressures Bullock to tell him why he flipped on the case, he finds out that Loeb has criminal evidence on most cops in the GCPD. Bullock killed a mob connection years ago when the boss held a gun to his head and told him to choose his fate. That was Bullock’s “Cobblepot,” meaning the one bad thing he had to do in order to save his own life, but that put him under the thumb of the Commissioner, a man once accused of killing his own wife. With this information, Gordon, along with Harvey Dent, decide to find out where Loeb is stashing all of this evidence and go after him. The two shake down Loeb’s old partner, who tells them to visit a man named Shi Lu, a Chinese bookkeeper. It’s all a setup though, and the two are chased by Lu’s men. They’re cornered, but Bullock shows up in the getaway car just in time. It’s a turn of conscience that, while predicatble, at least feels earned. Bullock’s been warming to Gordon all season, and he sees this as his chance to maybe finally do some good in terms of cleaning up the GCPD. Elsewhere, Mooney is making her move to gain some control in the facility that’s currently harvesting organs for some undetermined purpose. Mooney, complete with a new blue eyeball, suggests to the facility’s owner, Dr. Francis, that she become his right-hand man. He asks her to prove herself first, so she shows him that she can keep bodies coming into the facility and keep his organ needs sated. There’s not much to the storyline, and it’s a bit of a lackluster payoff to a couple episodes of solid buildup. Mooney’s ascent is quick, which tells us how ruthless she is, but that’s nothing new. The storyline exists on a different level from the rest of the episode, all cartoonish flair–I couldn’t help but laugh at the ridiculousness of the reveal that Dr. Francis’ former office manager is now equipped with breasts and ladies’ limbs–never really rising to the same heights of complexity that the rest of the episode showcases. While Mooney is off on an island (quite literally), Bullock and Gordon use Cobblepot to gain access to Loeb’s files. Gordon, against Bullock’s advisement, agrees to owe Cobblepot a favor, no questions asked, along with access to the files for five minutes, in exchange for the location. They head out to a farm that Loeb owns looking for the files and, after a shootout with an elderly couple, find Loeb’s daughter, Miriam, imprisoned Jane Eyre style in the attic. They question her and find out that she killed her mother, not the Commissioner, and that he’s been covering it up ever since. That’s enough for Gordon to go back to the Commissioner and leverage for Flass to be put back on trial while also forcing the Commissioner to hand over Bullock’s file. What makes all of this work is that it’s the first time we’ve seen Gordon significantly compromise his morals. He knows Loeb is dirty, but he needs him to stay on as Commissioner because then he can control him, rather than get him fired and end up with another one of Falcone’s lapdogs. More importantly, the decisions made in this episode potentially have consequences down the line. Gordon now owes Cobblepot a favor, and even Bullock, not exactly the cleanest cop around, knows that’s not a good thing. Sure, Gordon uses his leverage with Loeb to gain the Commissioner’s support as the new President of the GCPD union, but is this the beginning of Gordon’s cleaning up of the department, or the first step in him compromising everything he believes about being a cop? We kind of know the answer–that’s the inherent problem with prequels–but there’s intrigue in how Gordon approaches his new role in the GCPD. 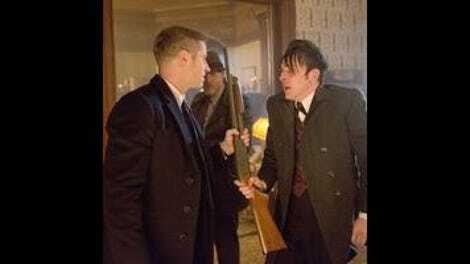 “Everyone Has A Cobblepot” does a good job of building up a more nuanced and unique understanding of Gotham, and the result is the season’s most confident and compelling hour of television. Never Mind The Bullocks: Shaking up the status quo and awarding this week’s best line not to Harvey, but to Cobblepot. When Bullock tells him the farmhouse doesn’t seem like a place where someone would hide evidence, Cobblepot asks him if he expects a sign that says “super secret blackmail horde.” His utterance of “I have a soft spot for old ladies” comes in at a close second. So now both of Hannah’s parents on Girls have found their way on to this show. It was a great pleasure seeing Becky Ann Baker wielding a shotgun. There was no way Edward was winning anyone’s heart with those sad, ugly flowers.